Discussion in 'Low-carb Diet Forum' started by Claire87, Apr 27, 2013. This recipe is adapted from a baker's recipe, so the all processes need to be followed for it to work properly, but it yields some pretty fantastic results. 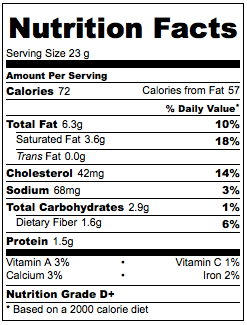 Nutrition for a 19 g baked strawberry scone. My scones came out at 38g because I wanted them to look like a scone, so I estimate about 6 carbs per scone, but they are so full of proteins and fats, you probably won’t be able to eat more than one—especially if you fill it with butter or low/no sugar strawberry jam and whipped cream ^^. 1/2 cup (57g) coconut flour, divided into 6 tbsp and 2 tbsp. 1 tbsp (10g) golden linseed (whole). 2 teaspoons (10g) baking powder. 6 tablespoons (85g) refrigerated unsalted butter. Make sure the butter is hard and cold. 1/3 cup (80g) heavy whipping cream. 1 teaspoon (4g) pure vanilla extract. Weigh out the strawberries and chop them up into pieces. Set aside for later. In large bowl mix 6 tablespoons of coconut flour, linseeds, baking powder and salt. Set aside. Cut the cold butter into small cubes and work it into your coconut flour mixture using your hands or a pastry blender until you have a course meal texture. It’ll feel quite sticky. Slowly add your liquid egg and cream mixture and mix in with a fork until you have dough. Save a little bit of the cream mixture for glazing later. A tablespoon should do. Add your extra 2 tablespoons of coconut flour now and mix until it thickens into a dough. What you have should be looking like scone mix by now. Let it sit for a few moments, and it will thicken as the coconut flour absorbs the liquid. Mix the strawberries into the dough evenly. Put the mixture in the freezer for 20 minutes. Take the cold mixture out of the freezer and make ten small dough balls in your hands. Flatten them slightly as you place them on a parchment paper lined baking sheet (to make a scone shape) and then put the tray in the freezer for another 20 minutes. Try to do this process rather quickly because you will want them to stay cold. Preheat oven to 425F (218C) while you wait. Take the scones out of the freezer and brush each one with the remaining cream/egg mixture to glaze them. Take out of the oven and let cool on a tray. Here's a photo of my finished scones: (Yes, I ate one before I took the photo ). Looks great! Where can I get coconut flour from? I dislike coconut with a passion, can't stand it :sick: So, does coconut flour really have a big taste of coconut and are there any other ingredients mixed in with it. Sorry to ask, but I have Coeliac disease and I don't do a lot of free from baking because of the high carb content ( rice and potato are the main ingredients) I do miss a nice scone oh I'm type 1 as well. The coconut flour is really stong coconut flavoured in my opinion, but there is Almond flour, which would make a perfect substitute, if you like almonds? You could also try it with roasted soya flour, that has the same nutritional value and not much of a taste at all. If you go with soya flour, I'd add a bit more vanilla extract to give it more flavour and a bit more sugar substitute/or a more powerful flavoured fruit than a strawberry. It might be a case of testing some different things to see which one works for you. Thanks Claire, I have used the Almond before, I think I will try the soya flour and I absolutely love cheese. Hopefully I will try it out soon. With the savory scones, do you reckon these will be like the American style biscuits? I might have to give it a go, if I can get a low carb version to go with some chicken, yum!! OMG, Claire these look *yummy*!!! The cheese scones should come out like a scone. Soya flour density and coconut flour are similar, so they should be a crumbly savoury scone in texture. Keeping the mixture cold is the trick to a scone. Soya flour may make them a bit more orange coloured, and slightly nutty flavoured. I tested out salted butter, and actually I'd stick to unsalted butter. They were a bit too salty. So for cheese scones. Skip the sugar and strawberries. Replace Strawberries with grated cheddar or a strong cheese that you like. Also sprinkle a bit of cheese on top of the scone instead of glazing for extra cheesiness. If you're feeling adventurous, you could try garlic salt rather than salt or some italian herbs. Did you like the cheese ones? I think I will definitely have to give this a go as soon as I get all the ingredients. 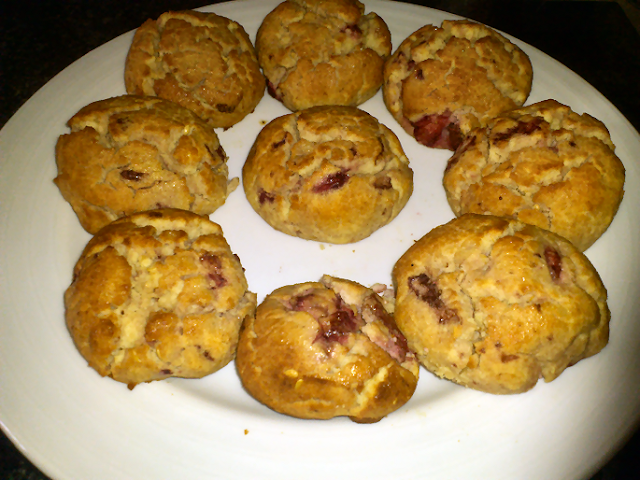 Have you tried the strawberry ones with jam & cream like a traditional scone? Ooh Paulc where is the market you get the coconut flour at that price from?! I don't live a million miles away and at that price would drive over to sock up - currently pay about twice that for 500grm!! They look lovely Claire but I would only eat one as a special treat as your increased sized scones means they have 94 cals each, and if you add cream to that (which I would ) it will up the calories even more. Low carb but not low fat so not good if you are trying to lose weight as well as control your bg levels. When I experimented with almond flour everything just tasted of almonds even with vanilla essence or cocoa added, which is fine if you like almonds but I dont particularly, do these have a strong taste of coconut? Oo, cheaper than my health food shop, thanks MCMLXXIII! go in on street view and talk a virtual walk up the street to the north west, there's a few more. and here's an Asian wholesale place but I haven't looked in here for coconut flour as I haven't run out yet. Will drop in soon.